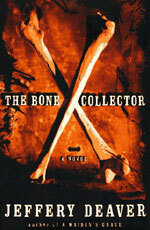 adapted as "The Bone Collector"
Synopsis: Lincoln Rhyme, ex-head of NYPD forensics, was the nation's foremost criminalist, the man who could work a crime scene and come away with a perfect profile of the killer, frozen in time. Now, Lincoln is frozen in place — permanently. An accident on the job left him a quadriplegic who can move just one finger, a great mind strapped to his bed, mulish and sarcastic, hiding from a life he no longer wants to live. Until he sees the crime-scene report about a corpse found buried on a deserted West Side railroad track, its bloody hand rising from the dirt. It belonged to a man who got into a cab at the airport and never got out. Reluctantly, Lincoln Rhyme abandons retirement to track down a killer whose ingenious clues hold the secret to saving his victims — if Rhyme can decipher them in time. The search leads him to the Bone Collector, whose obsession with old New York colors every scrap of evidence he leaves for Rhyme and his new partner, Amelia Sachs, whom he drafts as his arms and legs. But she's never worked a crime scene in her life — and he can only whisper in her ear as she does the exacting work he loved more than anything else.